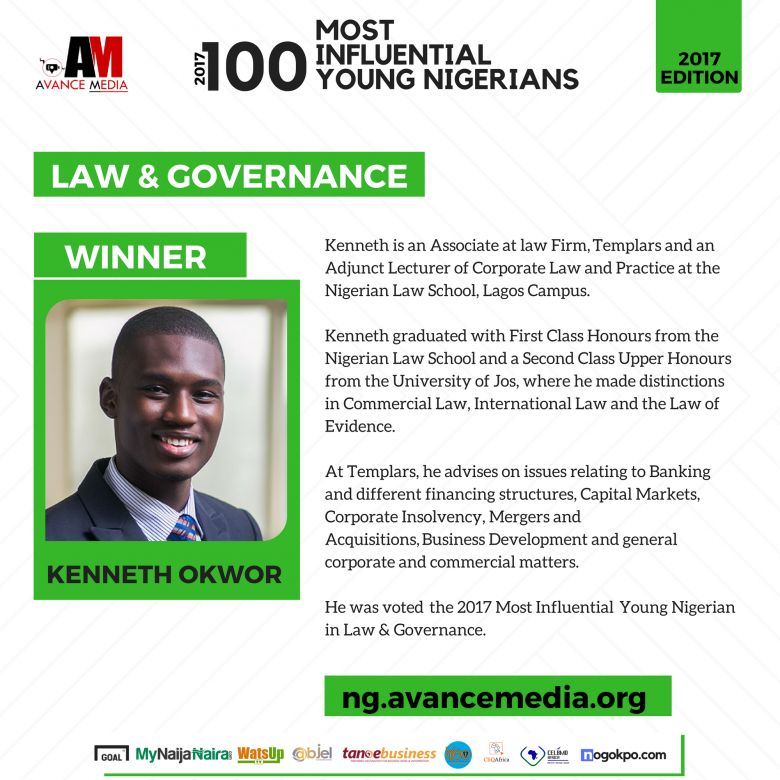 After a successful Poll by international reputed rating establishment, Avance Media, Lawyer Kenneth Okwor has been voted the 2017 Most Influential Young Nigerian in Law & Governance in one of the most credible and respected rankings system that honours youth excellence in Nigeria. 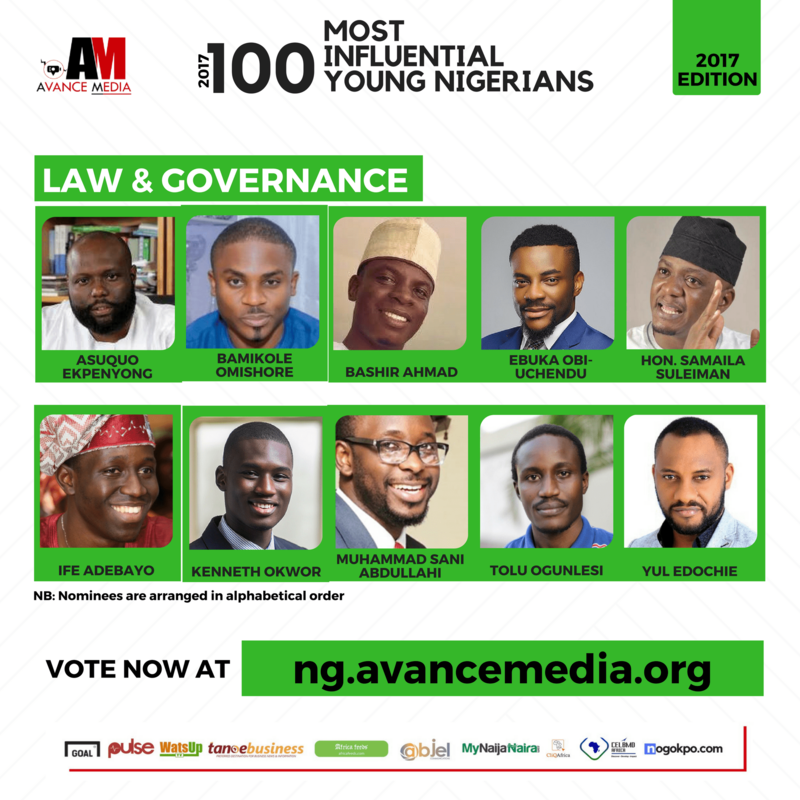 Below are the Most Influential Young Nigerian in Law & Governance as voted by the Public. The poll which drew public participation from over 90 countries voted Footballer, Victor Moses as the Most Influential Young Nigerian. Motivational Speaker, John Obidi, Templars Law Associate, Kenneth Okwor, Founder of Ambassadors of Africa, Prince Louis Omolayo Adekola and Arsenal Skipper, Alex Iwobi were also voted among the top 5 most influential young Nigerians respectively. Prince Akpah, MD of Avance Media explained that, the ranking which features young people creating positive influence in Nigerian is meant to inspire young people across Nigeria and change the negative perceptions of the potentials of young people. Profile of Kenneth Okwor, Nigeria’s Most Influential Young Person in Law & Governance. Kenneth is an Associate at law Firm, Templars and an Adjunct Lecturer of Corporate Law and Practice at the Nigerian Law School, Lagos Campus. Kenneth graduated with First Class Honours from the Nigerian Law School and a Second Class Upper Honours from the University of Jos, where he made distinctions in Commercial Law, International Law and the Law of Evidence. At Templars, he advises on issues relating to Banking and different financing structures, Capital Markets, Corporate Insolvency, Mergers and Acquisitions, Business Development and general corporate and commercial matters. He was voted the 2017 Most Influential Young Nigerian in Law & Governance.